Are you experiencing Neck Pain in Calgary? Then National Spine Care has the solution for your Calgary Neck Pain issues. It is called the Multi Cervical Unit (MCU). MCU™ Multi-Cervical Unit is considered the most effective and complete system for the assessment and rehabilitation of patients suffering from neck pain, whiplash associated disorders (WAD), and general cervical spine disorders. The MCU is a technology-based machine specifically designed to assess objectively and treat chronic neck pain and related conditions. Your neck is also known as the cervical spine. It connects your skull to your upper back by way of 7 bones (called vertebrae) which are held together by several ligaments and moved by dozens of muscles and tendons. It’s an area full of moving parts which allow it a broad range of motion. So when something goes wrong with the neck, it can be painful & debilitating. A sprain to muscles, ligaments or tendons within the neck area is the usual cause for neck discomfort. Most minor muscle, ligament or tendon injuries within the neck will subside with Chiropractic care, and can be resolved with improved lifestyle factors such as posture & exercise. One common characteristic of chronic neck discomfort is pain that radiates down the arm, sometimes in to the palm and fingers. There may also be numbness or tingling. These symptoms are a signal that a nerve is being “pinched”, and they can make daily tasks exhausting. Chiropractic and physiotherapy techniques can often effectively release the pinched nerve to eliminate these painful symptoms and let you feel your best again. How the MCU can strengthen your neck! 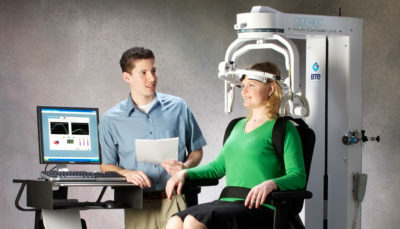 Using the MCU, we can measure your neck strength in 16 directions to see which of your neck muscles are weak. We can then help you strengthen those neck muscles. We will retest you to make sure you are now strong in all directions. Just as importantly, we will make sure that you are balanced left to right and front to back. Once you have enough strength in your neck muscles, then you will be able to support the weight of your head without aggravating your symptoms, or without your neck continually going out of place. The Multi-Cervical Unit is the only effective way to test your neck in all directions, then quickly rebuild your neck strength and restore balance. book your Calgary Neck Pain consultation appointment today!